Cocoa and cocoa by-products move more than 120 billion USD on the global market, with an increasing interest for quality products. Italians are not among the largest consumers of chocolate, but the country is rich in chocolate processing industries, to the extent that exports of Made-in-Italy chocolate account for 6% of the world market. Versatile plants. The manufacturers of machinery offer an extensive range of equipment for the storage, conching, tempering, coating, cooling, moulding of chocolate, next to complete lines for the production of chocolate, which can be completed with semi-automatic or automatic packaging machines. The extensive production range of the confectionery industry encourages machine manufacturers to design more and more versatile equipment. The market offers (automatic) systems for the continuous mixing of different solid and thick ingredients (chocolate, creams a.o.) in variable percentages, with the possibility of entering new recipes, hence also mixing proportions, directly from the operator panel. These lines can be used to produce plain or cream-filled chocolate, coupled products by adding nuts, puffed rice, and other granular products. Mini-lines are also proposed for chocolate processing, designed to meet the needs of small-medium chocolate manufacturers. Generally, they comprise mixer, first stage refiner, second stage refiner and horizontal conching machine with a single agitator shaft. In order to reduce spaces, without giving up automation, there are dosing machines which, equipped with a double-wall tank, allow to mould one product and its filling by one dosing. 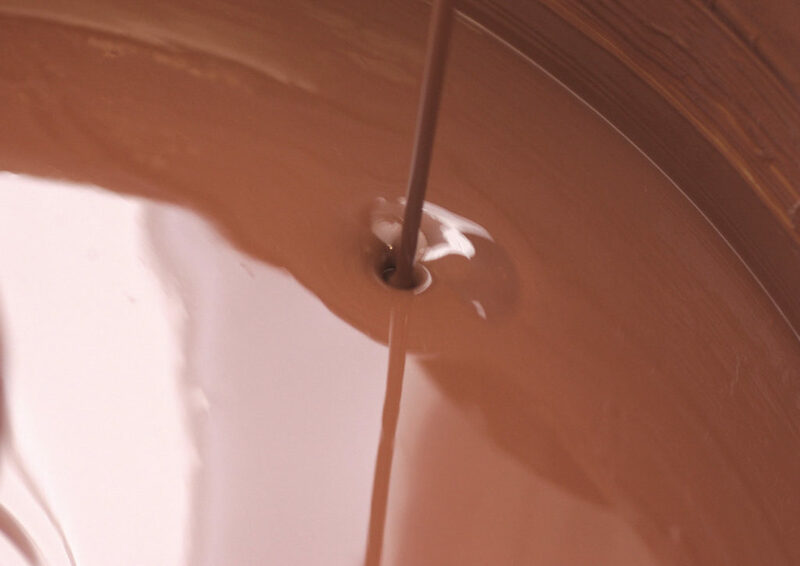 Heating of the two tanks containing chocolate and filling is separated, allowing the dosing of different products. Always within the context of production versatility, there are intermittent chocolate moulding lines for depositing aerated and non-aerated chocolate masses. The main units and groups that make up the chocolate moulding line are: moulds heating units, depositors, vibration tables (vertical and horizontal), demoulding units. The moulds heating units can use as a source of heat the infra-red rays, as well as hot-air forced-ventilation tunnels. Hot air, for instance, is used when constant temperature on the mould ensures a regular product thickness. The automatic demoulding unit is installed at the end of the line, and can be equipped with a rotary plate and hammers or vacuum suction cups. The moulding plants implement different technological solutions, to better meet the production needs of customers, for the production of both chocolate bars and products with solid or creamy fillings. There are various depositing technologies available: point depositors, one-shot systems, ribbon type depositors for large chocolate bars and bars with solid fillings. For end-of-line packaging, processing lines can be integrated with automatic aligner feeder, placed at the exit of the moulding line, that receives, lines up and moves the products to the wrapping machines. Some lines are equipped with a station for storing the product in case of machine stop. When the machine resumes operation, stored products are returned to the automatic cycle and conveyed to the wrappers. In modern lines, all operations are managed by a PLC, which monitors every step, saves the recipes, all machine stops or failures; thanks to the PLC, only one operator is necessary to survey the line and to remove, if necessary, any broken or non-complying product. The lines are connected by suitable conveyor belts of different lengths; conveyors can be extractable for better cleaning, even without using tools. Safe products: attention to cross contamination. Health and food safety regulations require particular attention to the issue of allergens due to cross-contaminations. 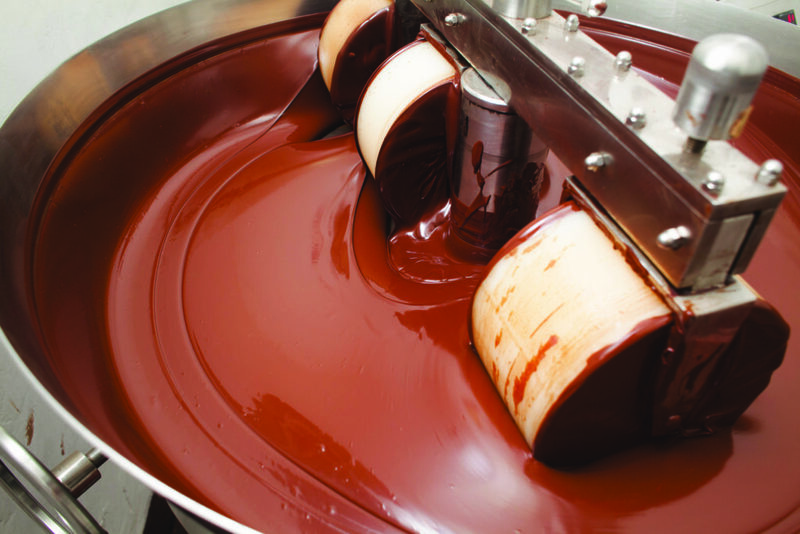 Next to accurate cleaning of all equipment to remove any traces of improper ingredients, more and more confectionery firms require production lines with dedicated tanks for the storage of the different varieties of cocoa: organic or conventional cocoa, white, milk, dark, or nut chocolate. There are also delicate handling and conveying systems, like the pneumatic ones, which can delicately move beans and other ingredients avoiding possible contamination or crushing. The highly automated chocolate processing plants integrate monitoring and integrated production management systems, have production planning and programming capabilities, and ensure food traceability along the entire production chain, from the raw materials until the product is ready for consumption. New trends: raw and pink chocolate. One of the most innovative products on the market is raw chocolate, which is processed at temperatures not exceeding 42°C so as not to impair temperature sensitive components. 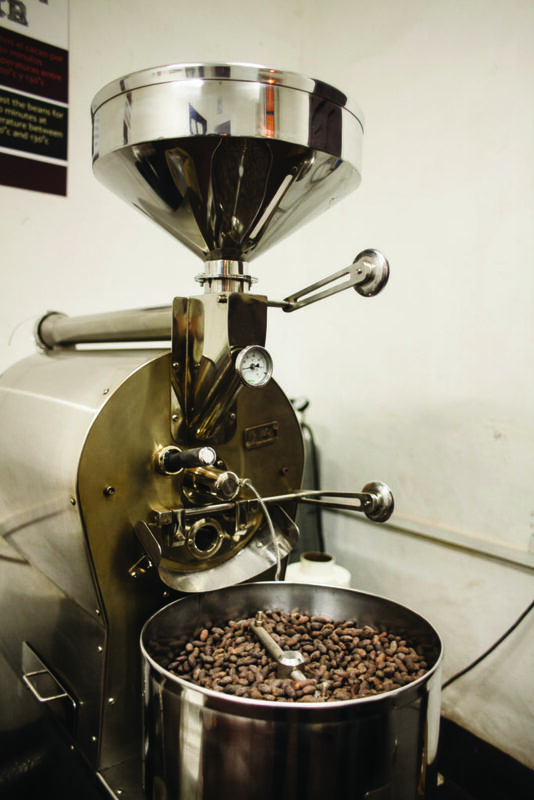 The conventional cocoa beans roasting process is replaced by slow drying in controlled atmosphere. Beans’ fermentation occurs in a controlled process, with continuous mixing and ventilating the product so as to keep temperature below 40°C. Even beans drying occurs at low temperature (35/40°C for approx. 3 weeks). To ensure that there are no pathogenic and deteriorating micro-organisms, on fresh cocoa beans (i.e. not subject to heat), an ascorbic acid based ingredient is used. The fat fraction, i.e. cocoa butter, is separated from the lean fraction, i.e. cocoa powder, through mechanical processes. Chocolate ingredients are mixed at 42°C. As for conventional chocolate, even for dark chocolate, the next steps include tempering, moulding, cooling, demoulding and packaging. Over the last months, another chocolate has extended the range of well-known white, milk and dark chocolates: the pink chocolate. The Swiss company Barry Callebaut launched on the market a pink chocolate called Ruby. Its colour derives from the cocoa bean used to produce it: the Ruby cocoa bean. These beans are sourced in various parts of the world, as Ecuador, Ivory Coast, and Brazil, and processed in order to enhance their colour, aroma and flavour. Ruby chocolate is an all-natural hue, without flavourings or colours or additives. According to the producer, this chocolate is not bitter or sweet, and has the taste of chocolate with freshness and berry fruitiness to it. Micro-encapsulated cocoa. Like sugar, micro-encapsulated cocoa is resistant to the contact with water and fats, and for these properties it is used in confectionery for the products that require a decorative dusting, like cakes, tiramisu and other desserts. It remains intact and dusty, and clings well to damp, fresh and frozen products until consumption. It is also called water repellent, waterproof, non-hygroscopic cocoa. Although not a new product on the market, there are only a few companies that can produce high-quality micro-encapsulated products. Micro-encapsulation, in fact, allows to process cocoa powder and other ingredients like sugar, covering them with a barrier of vegetable fat to prevent interactions with other ingredients during the various production stages. Only a higher temperature can cause the melting of the fat barrier, so that there occurs a reaction between the ingredient and the product below. The capsule thickness can be adjusted to production needs. There are several production technologies available to this purpose: first of all there is the spray drying technology. In any case, the final result is the creation of solid particles ranging between 1 and 1000 µm: the micro-capsules. The substance of interest, in this case cocoa powder, is called core, whereas the capsule is called shell or carrier material. The resulting product offer longer shelf-life and higher quality, since the micro-encapsulation prevents cross-reactions between the various ingredients until when required. Ingredients can be dispensed with more accuracy, with considerable savings. Micro-encapsulation is a method used in the food industry not only to prevent undesired cross-reactions between different ingredients, as for instance cocoa powder and the product, but also to preserve temperature sensitive functional ingredients or ingredients subject to oxidation during the processing or storage stages; or as in the case of probiotics, to ensure that they reach the intestine intact and functional, passing through gastric acids; or to limit the loss by evaporation of volatile compounds, and mask off undesired flavours. In the last Salon du Chocolat in Milan, several data on the chocolate market were communicated by Euromonitor International. Western countries are registering a stagnation or slowdown in chocolate consumptions (-2% between 2010 and 2015 in North America).To compensate, overall expenditures increase (in Europe by 2%, and in the US by 4%). In other words: we eat less, but it is more expensive. In China, in the last 10 years, consumptions have more than doubles, although they are still far from those of the Western countries:100 grams per year for the Chinese, 8 kg for the British. According to forecasts, China will be the second largest chocolate market within 2020.In 2016, at least 123 billion USD were spent for cocoa and its by-products, approximately 30 only for chocolate bars or small bars, mainly milk chocolate, with a growth of 12% between 2012 and 2016.The world production per year decreased by 5% in the 2-year-period 20133-2015, then managed to return to grow, with a production record of 4 million tons in 2016.According to the estimates of the International Cocoa Organization Icco, demand will exceed supply in 2020.International markets have reacted by increasing the price of cocoa. However, when at the beginning of 2017 Euromonitor indicated that ICCO’s data were not reliable, cocoa price has dropped by 30% in less than 3 months. This point out that there is a strong speculation on this products. The Italian market is worth 2.5 billion Euro. Exports of Made-in-Italy chocolate reached 665 billion Euro, corresponding to 6.1% of the world market. The raw material, i.e. cocoa, mainly comes from the Ivory coast (1.7 billion tons/year in 2015), and Ghana (835thousand tons in 2015), together covering approximately 60% of the world market. Their cocoa beans are mainly used to produce couverture chocolate, while those from Venezuela, Ecuador, Columbia and Peru are used for chocolate bars, pralines and chocolates. The major processors worldwide are the Dutch, with an annual production of 530thousand tons. Italians are not large consumers of chocolate:4 kilograms compared to the 9 kg of the Swiss. Dark chocolate still is the favourite, with 40% of purchases, followed by milk and white chocolate which are losing market shares even due to the increased number of lactose intolerant consumers. However, new markets are opening: biological, halal, kosher, vegan, gluten-free. Smaller formats like pralines are preferred over the conventional bar.